Please note! The request form requires you to indicate that you have read and agree to the information provided below, including information regarding the consulting support process, authorship, and manuscript preparation. The Department of Public Health Sciences (DPHS) provides Consulting & Collaboration Support to assist researchers with study design, data analysis, statistical graphics, outcomes and comparative effectiveness research, data base development and management and other multidisciplinary analytical services, such as evaluation methods, surveys and community engagement strategies. We offer these services through the School of Medicine core and charge on an hourly rate basis. Jim Patrie provides a biostatistical consultation. We have three basic models for research collaboration and consultation. Hourly rates apply for Model 3. DPHS faculty member is a co-investigator in grants submitted and awarded. Another SOM entity (department, division or center) funds a pre-set % effort of a DPHS faculty or staff member. DPHS faculty member establishes ongoing relationships with faculty in the entity, providing consulting support services as needed. Model 3: Consulting Arrangements Pre Award (grant preparation for eventual submission) – Hourly charge for those who are not providing DPHS faculty % salary support on that grant, or on retainer (see models 1 and 2 above). For example, these would include internal grants, small grants, pilot studies, K awards, etc. Post Award (work on grants already awarded) – Hourly charge for those who are not providing DPHS faculty % salary support on that grant, or on retainer (see models 1 and 2 above). Other non-grant-funded consulting: (funded, for example, by clinical-income, department, etc.). Hourly charge for those who are not providing DPHS faculty % salary support on that grant, or on retainer (models 1 and 2 above). 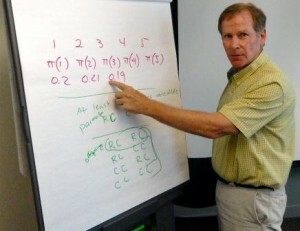 An investigator consults with Ken Scully. Collaboration and consulting support typically begins with a meeting to discuss the project and to estimate the amount of time involved. Sometimes we can answer investigators’ questions and solve their analytical problems during this initial meeting. However, it’s usually true that further work will be required. In those cases, we develop an initial budget after the meeting and present it to the researcher promptly. It will be generally based on a team of senior and junior department members’ efforts in order to provide both prompt and economic collaboration/consulting support. We are often unable to envision the scope of work for the project until work commences. It is very common for researchers to develop new ideas and new hypothesis and to refine measurements after initial data analyses. So our initial budget estimation will be sufficient to get the project started. We account accurately for all time spent on the project and will communicate to the researcher a better estimate of the required budget as the project unfolds. We will give an accounting of time spent on the project as frequently as desired by the researcher. Each project will be performed by the appropriate level faculty or staff. Relevant personnel efforts will be fully discussed and provided to the investigator(s) for each project. Guofen Yan and Jennie Ma explore research collaboration. A frequently asked question is whether research methodologists (e.g., analysis, statistical graphics, statistical reporting, and interpretation, data base development and management and other multidisciplinary analytical services) consultants should be co-authors on scientific papers. We recommend that decisions about authorship should be independent of consideration of funding sources. As recommended in published guidelines (Parker RA, Berman NG: Criteria for authorship for statisticians in medical papers. Statistics in Medicine 17: 2289-2299, 1998), “The basis of financial support should be the time/effort spent on a project and the basis for authorship should be whether the statistician has made a scientific contribution to the project.” Also, note that, if appropriate, it is quite beneficial to include biostatisticians in the publications since those are considered as the most critical evidence of long-term biostatistical collaborations in most current grant funding reviews. The statistician has to develop new statistical methods to meet the project’s needs, or she/he has to combine existing techniques in a novel way. The epidemiologist has a major role in designing the study. The DPHS faculty/consultant writes part of the manuscript other than a standard paragraph or two describing which statistical methods were used. The DPHS faculty/consultant is asked to critique an initial draft and the statistician spends a considerable amount of time suggesting alternative wording and presentation of results. The DPHS faculty/consultant provides data analysis along with interpretation of results. By JAMA’s criteria for authorship for statistical experts involved in the analysis and interpretation of data used in a manuscript; a statistician is a co-author if (1) he/she took part in the drafting of the manuscript or (2) he/she was involved in a critical revision of the manuscript for important intellectual content. It is our policy that acknowledgment of the contribution of the staff or faculty of the Department of Public Health Sciences may not appear in a paper without that person’s written approval. Above all, it is important for the School of Medicine researcher and PHS faculty assigned to the project to agree on criteria for authorship early in their collaboration. Whether or not the statistician is an author, it is important to allow sufficient time for the statistician to check statistical results and descriptions of statistical methods that appear in a manuscript. We frequently find inconsistencies between analyses we perform and basic descriptive statistics computed by the investigator. For example, the primary statistical comparison may emphasize differences in medians while the investigator quotes mean values elsewhere in the manuscript. When different analyses are carried out by different personnel, it is beneficial for the investigator and statistician to map out the entire analysis-together in advance. The same is true for DPHS faculty in other disciplines. Please note! The request form requires you to indicate that you have read and agree to the information provided on this page.